John Hanlon with his Scotland cap in 1913, aged 21. John Kelly. All rights reserved. S1. 206. While at 58 John Hanlon might regret that he can no longer play in first class football or retun 1 min 55 sec. for the half-mile, he certainly enjoys his game of bowls. 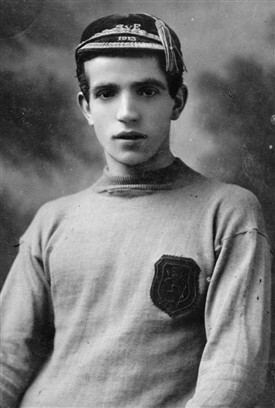 John played for Hamilton Academicals from 1913 and in 1922 transferred to the Hearts. As a professional "ped" (runner), Hanlon (running as J. Harris) also made his mark. His first big success came in 1913 when he won the Manchester half-mile and then while serving with the Royal Scots he won the half-mile, the quarter, and the 100 yards in the 1919 Rhine Army Championships. In the year he signed for the Hearts, Hanlon won the Shawfield half-mile in 1 min. 55 sec. While major successes in the Powderhall Christmas half-mile eluded him, he gained second, third and fourth places in the event. His last appearance at the Powderhall track was in 1939. This page was added by Sybil Cavanagh on 11/04/2012. John Hanlon was my great uncle. A message for Anne and Janice. I mentioned John (Jock)'s sisters including Jane? and Annie was mentioned above by Anne. Jane seemed to live in Redcar(Yorks) and I remember visiting and walking along the beach. I am interested in great Aunt Anne as I do not remember meeting her. Did she move way from the Lothians? Also my sister is called Anne.